Today, managing your life means managing the stress that comes with it. 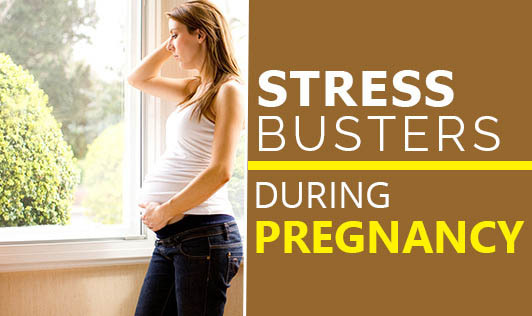 During pregnancy it helps if you are relaxed. You will have to deal with fewer aches and ailments, get to sleep better and feel less tired, be less dependent on artificial stimulants and generally be more alert and efficient. Most importantly, you will enjoy your pregnancy more. If you feel stressed and find relief when you receive help or support, then by all means accept the help that is coming your way. Grab the offers from friends, family and colleagues and lessen your work load whether at home or at work. Delegate or eliminate some of your work responsibilities. List the number of tasks for the day and cross each task off your list as you finish it. Take time out. Spend time away from pressure and activity without feeling guilty. Steal muments and relax in a tub or under a shower, guilt-free. Devote some planned time to music or a book or magazine, TV or any other activity you enjoy. Share your worries with someone: your partner, a friend or a professional counselor. Talking helps; talk about how you feel. Talking with your doctor for instance will also help monitor your general well being. Exercising helps. Go for brisk walks in the fresh air. Exercise helps the body release endorphins, the natural 'feel good' chemicals, which also energizes you. You basically get a chance to unwind and reflect. More importantly, don't ignore your diet. What you eat has an effect on how you feel. Eat fresh fruits and vegetables and avoid snacking on high energy foods such as biscuits and sweets. They are quick energy fixers, relieving you for 10 minutes or so but when your sugar levels take a dip afterwards you are left feeling no better off, lethargic even. Energy levels that go up and down worsen the mood swings you are more prone to now. It helps to have several small healthy meals to maintain your blood-sugar at steady levels. Eating smaller meals instead of three larger ones will also help control pregnancy sickness. If you are still working make it a practice to put some time aside for yourself. By doing this you will be able to cope with work, your partner and your daily routine without feeling hassled. If work situation gets stressful that you find it hard to handle, talk to your employer about part-time schedules or maternity options.